Hazi Md. Motashim Billah Motu, Chairman of Meherpur Pourashava has been re-elected in his position for the second time in 01-04-1999. He was born in a respectable Muslim family. His father is Alhaz Abdul Rouf and mother is Samsul Naher. He completed his education in Meherpur. 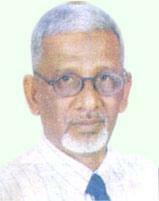 He was a Commissioner of Meherpur Pourashava for two terms. Due to his excellent performance as Commissioner he was elected for the first time as the Chairman of Meherpur Municipality in 28-03-1993. Mr. Billah is engaged with various social welfare organizations and clubs. He holds the position as Secretary of Rickshaw-Association and Secretary of Rifles Club. He is also the President of Meherpur Tennis Club. He is an educated entrepreneur, founder Secretary of Meherpur Mohila College and founder president of Poura College. Besides all these activities he has established couple of primary schools in cooperation with some local educationists and donors. He is a father of three daughters and two sons. This devoted personality is honored by all people. His commitment for development of Meherpur is marvelous.